BEIJING, Feb. 2 (Xinhua) — Veteran train driver Zhou Li, 54, has driven all four generations of Chinese trains — from steam locomotives to high-speed. 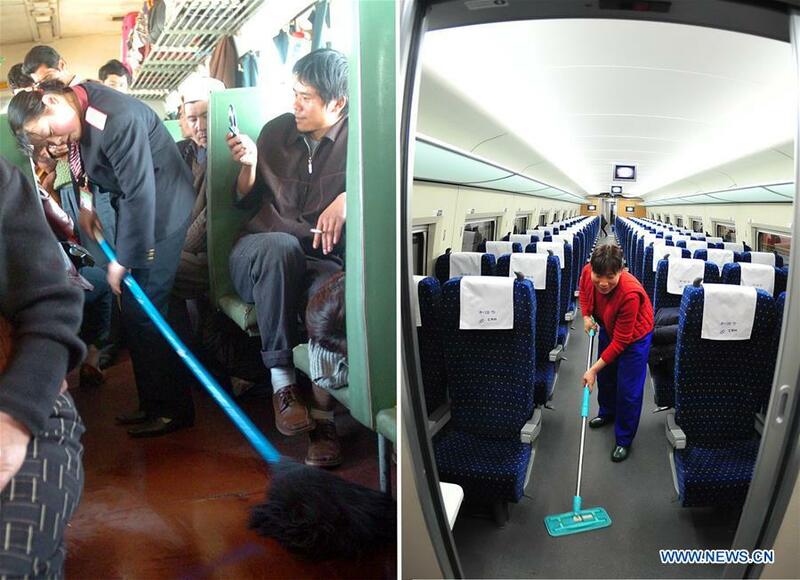 Having spent two-thirds of his Spring Festivals driving a train, this year is Zhou’s 31st Spring Festival travel rush. Zhou is one of many Chinese train drivers who have witnessed the fast development of the national railway network in connection with the changes of the world’s biggest travel rush. Since the founding of the People’s Republic of China 70 years ago, the speed of trains has increased sixfold while the length of the entire railway system has expanded from only slightly more than 20,000 km in 1949 to some 131,000 km by the end of 2018. Thanks to this enormous train network, the journey home for 413 million Chinese, the number of people who travel via train during the holiday this year, has become faster, more convenient and more high-tech. According to calculations based on archived reports by the People’s Daily, some 31 million trips were made via train during Spring Festival 1957, which seems like nothing compared to this year’s number. However, it still exerted a huge pressure on the country’s transport system. The People’s Daily even carried an editorial in 1959 urging short-distance travelers to walk or use bicycle wherever possible, to ease the burden on the public transport system. Just 10 years ago, standing in carriages filled with passengers and their luggage for a 58-hour trip was ordinary for many. Today, the constantly improving and expanding railway network and the launch of bullet trains means such journeys are less crowded and more enjoyable. Yu Maosheng, 38, said that he used to wait for several hours when queuing for train tickets, and it used to take him more than 30 hours to return home to Linyi in eastern China’s Shandong Province from Shenzhen in southern China’s Guangdong Province. Today, the trip between Shenzhen and Linyi has been shortened to 10 hours thanks to high-speed trains. In September 2017, Fuxing high-speed trains independently developed by China began to run between Beijing and Shanghai. With a speed of 350 kmh, it is the fastest train in commercial service in the world. Fuxing trains will be running on the railway between Beijing and Zhangjiakou, in northern China’s Hebei Province, when the two cities host the 2022 Winter Olympic Games. “Efforts are also being made to introduce intelligent railways, which will apply cutting-edge technologies including big data and artificial intelligence,” said Wang Junbiao with the China Academy of Railway Sciences. Meanwhile, China has developed the world’s largest real-time ticket service website, with nearly 3.5 billion tickets sold annually. New technologies including face scan check-in have been applied in many train stations. This year, Yu bought his tickets online and said he is looking forward to checking in with facial recognition technology. For veteran driver Zhou, he can still remember the days he would witness travelers carrying multiple bags while rushing to get on the train and secure enough room for their belongings. With neat and more spacious carriages, that chaos is rarely seen nowadays. “It all improved very quickly, just like the speed of the train,” he said.